I’ve written a little bit about the station in previous posts, but here is a little bit more about the station itself. 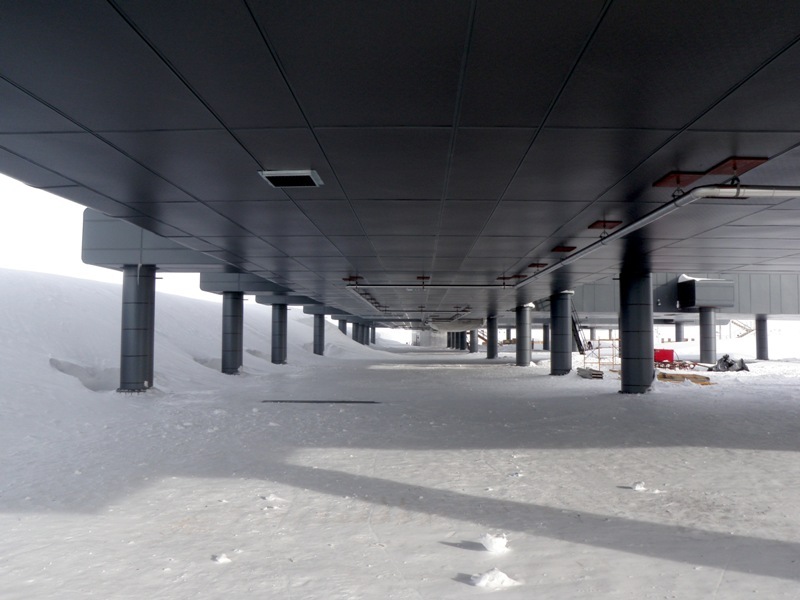 The Elevated Station sits about 12 feet above the ground on large steel pilings. Facing the Ceremonial Pole the front of the two story station is smooth and flat – the lower level cut away for a more aerodynamic shape in an attempt to reduce drifting issues. Four wings extend off the backside toward the berms. The long “front” of the station is where most communal sites are, while the gym, a lounge, an emergency power plant, bathrooms and housing are in the wings. There are three main entrances/exits to the station: Destination Alpha (D.A. ), Destination Zulu (D.Z. ), and the “Beer Can.” D.A. is the grand entrance and is closest to the skyway. 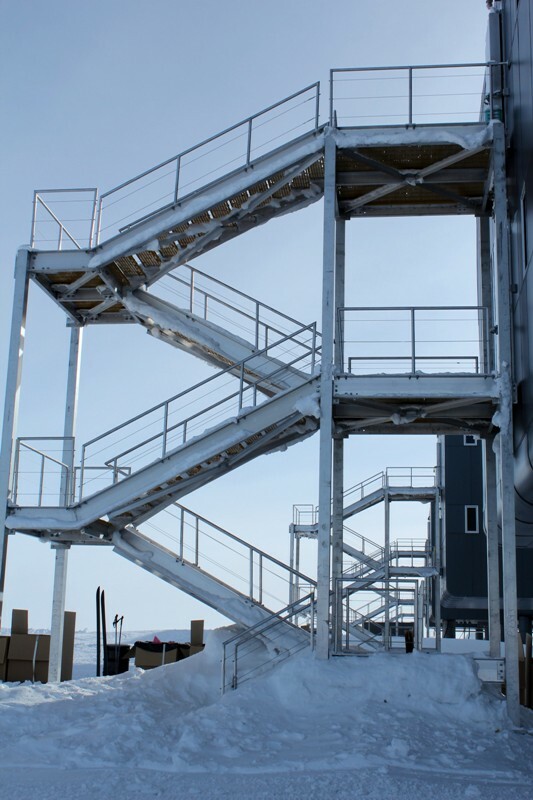 A wide stair case and short steps make for an easy climb for all the folks fresh off the herc and unused to the altitude. D.Z. is a little rougher with unfinished wood railing, but is the primary entrance to and from Summer Camp. 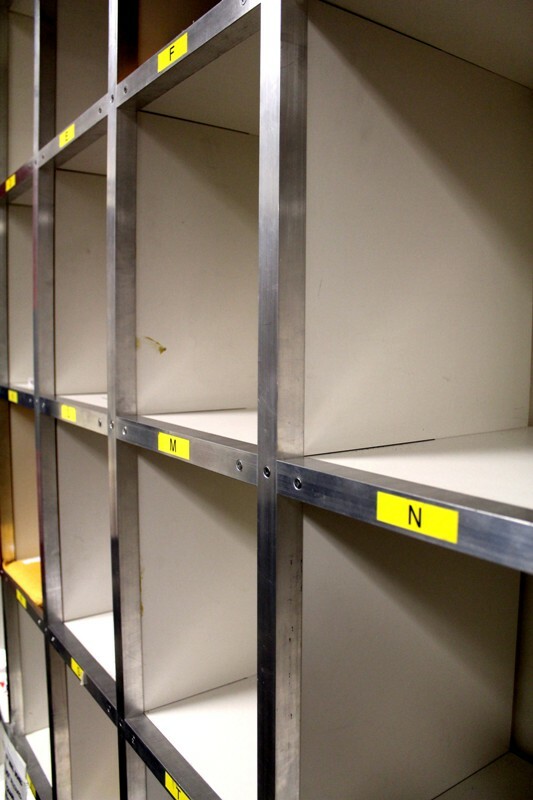 All the doors are large metal freezer doors with hanging sheets of plastic on the inside to block out drafts. 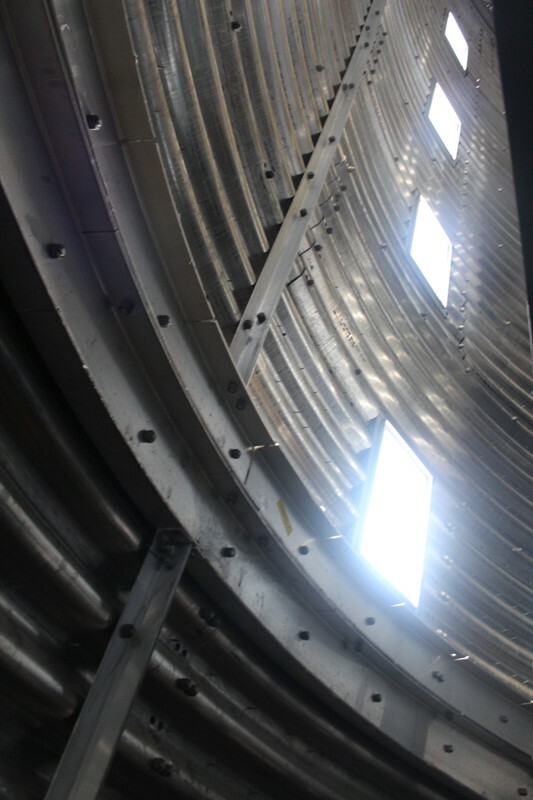 The “Beer Can” is a tall metal sheathed unheated cylinder housing many sets stairs that lead from the upper level of the station down to the Ice Tunnels and Arches. 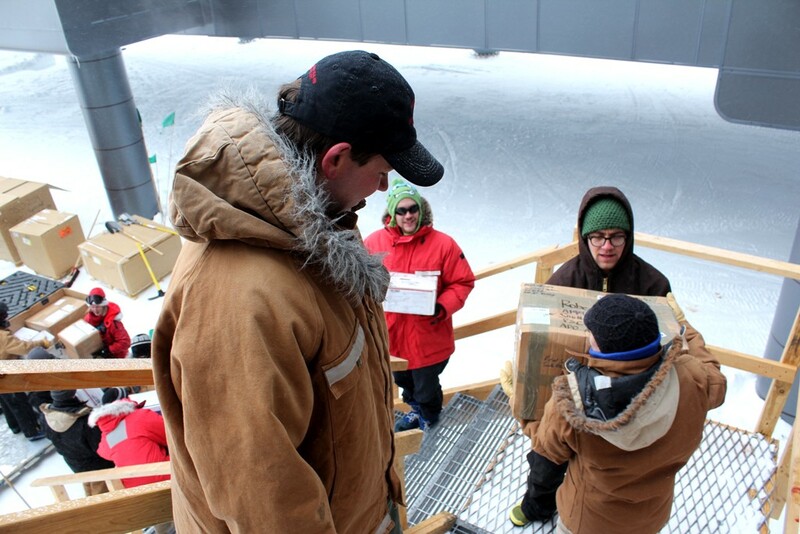 While an elevator was installed to help transport heavy awkward cargo and food, people must take the stairs. 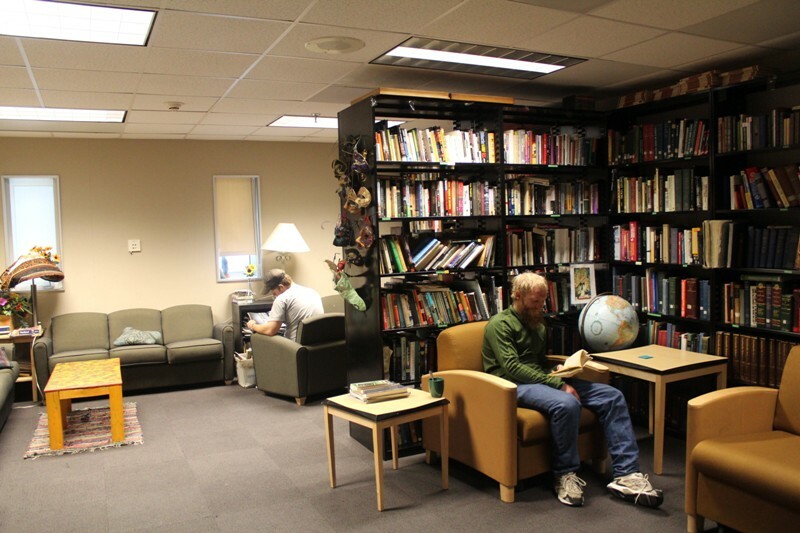 The lower level of the station contains a small lounge with some books and couches for movie watching. There is also an IT room that focuses on the radio and satellite equipment, the Craft Room, Reading Room/Library, Laundry room, Greenhouse, Post Office/Store and a coat room. 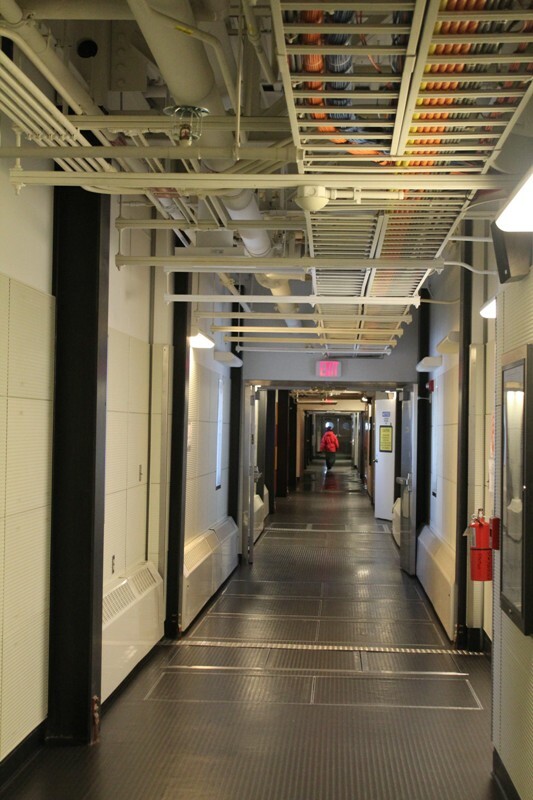 The upper level has the Galley, computer lab, science lab, and two conference rooms. Both levels look very similar and it’s a little confusing at first trying to remember which floor the library is on. Looking down the hallway outside the Reading Room - towards D.A. With Summer Camp being a bit of a walk away I try not to make more trips than necessary. On Sundays I shower out in Summer Camp then take my laundry and anything else I’ll want for the day and head into the station. 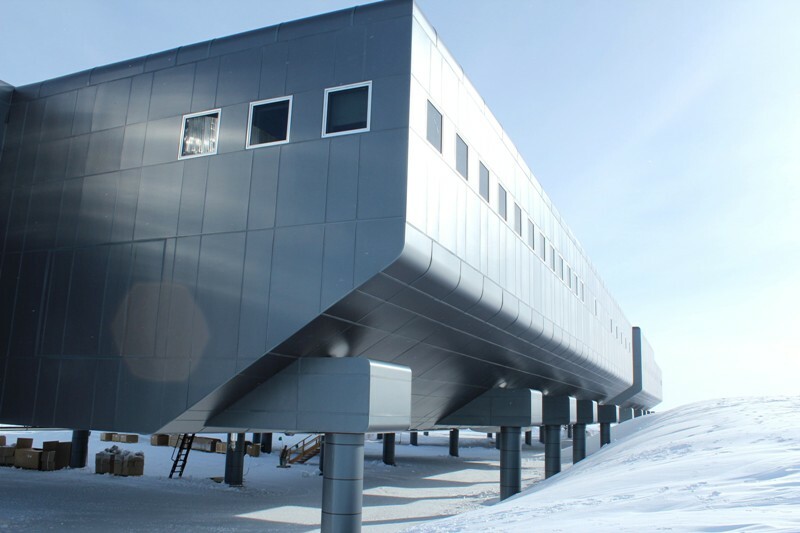 The Elevated Station is the third station to be constructed here at the South Pole. In 1957 the US Navy constructed “Old Pole” which was followed by the iconic Dome. Over the past 10 years the new Elevated station was constructed and the Dome was taken down piece by piece, and shipped back to the states. Old Pole, on the other hand, had a far more interesting fate. After being abandoned Old Pole was buried completely by about 30 feet of drifting snow. In the summer of 2009-10 a piece of equipment that was driving in the vicinity fell into a cavity that had formed around the remaining buildings. The area was cordoned off and last summer a team from CRREL (Cold Regions Research and Engineering Laboratory) came to survey the area with ground penetrating radar. With future safety in mind they decided to implode Old Pole. Crushing the buildings and collapsing the cavities with explosives. 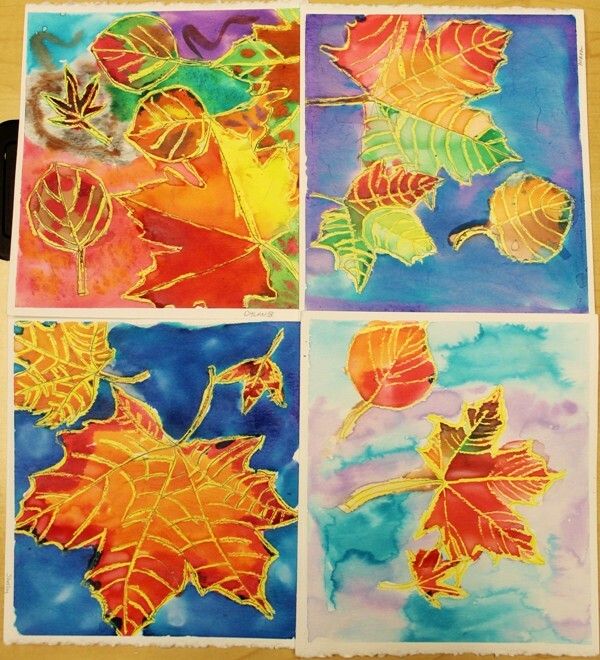 As a General Assistant last summer I got to help out with this project. Holes were drilled with hot water 30 feet deep to the station level and strings of 7-9 sticks (5.5lb each) of dynamite were lowered on detcord. Three days and three blasts later the site was finally deemed stable. 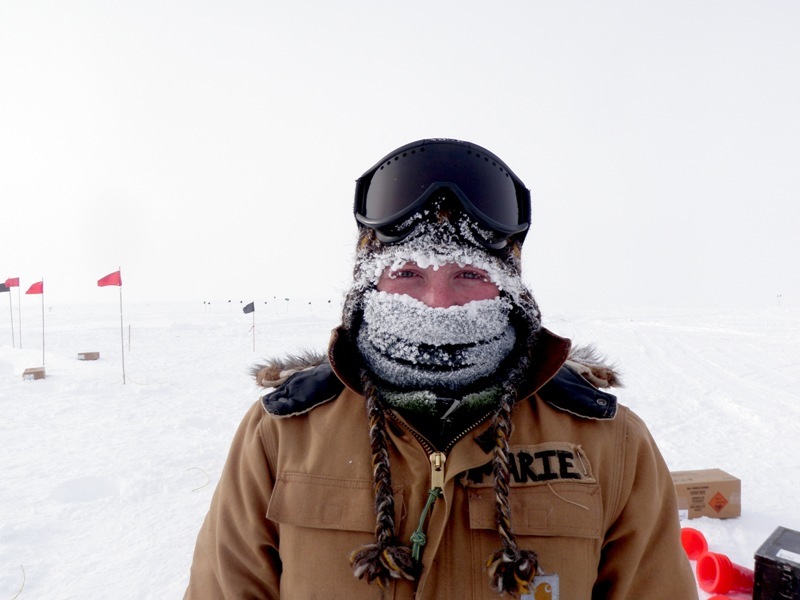 It was a chilly day – all the frost on my face is from my breath condensing and freezing to my neck gaitor and hat. It was quite the project and the other G.A. Jason and I were very excited to be a part of the small blasting crew. On the day of the blast people lined the roof tops of the buildings here and a general all-call was made by comms so no one would miss out. Using an old pump action detonating device we ignited the detcord. Geysers of snow shot up from each hole like a giant water fountain display and cameras clicked away. I stood with the blasting crew a safe distance away. 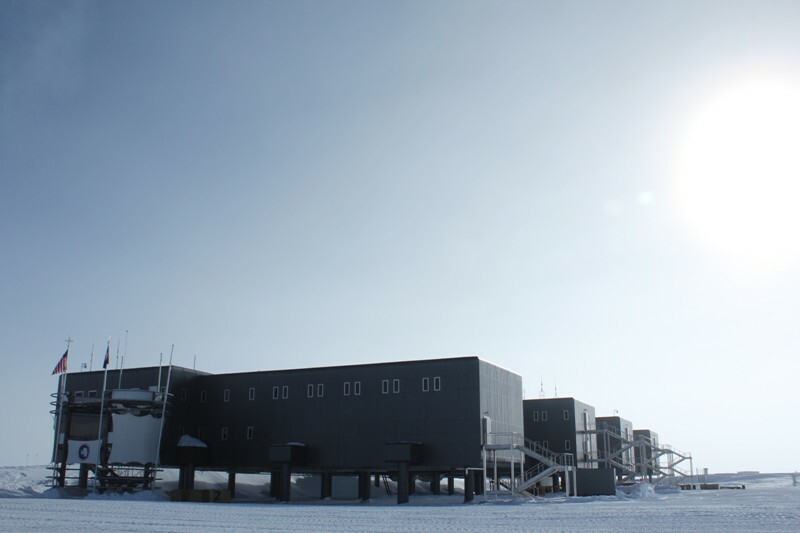 MAPO, or the Martin A. Pomerantz Observatory, is the first building one encounters upon crossing the skiway. 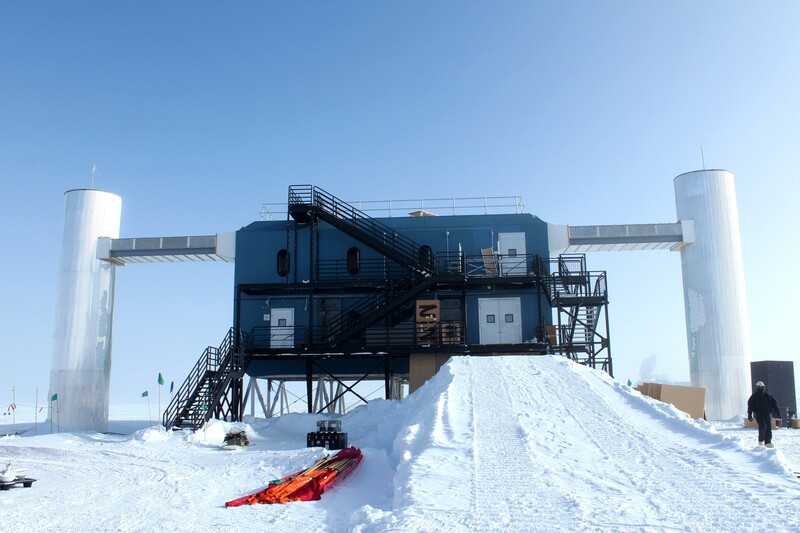 The blue box-like building housing the telescopes Viper (now complete and waiting demolition) and SPUD, used to sit high above the snow surface to avoid drifting issues, but the stilts are now long buried. 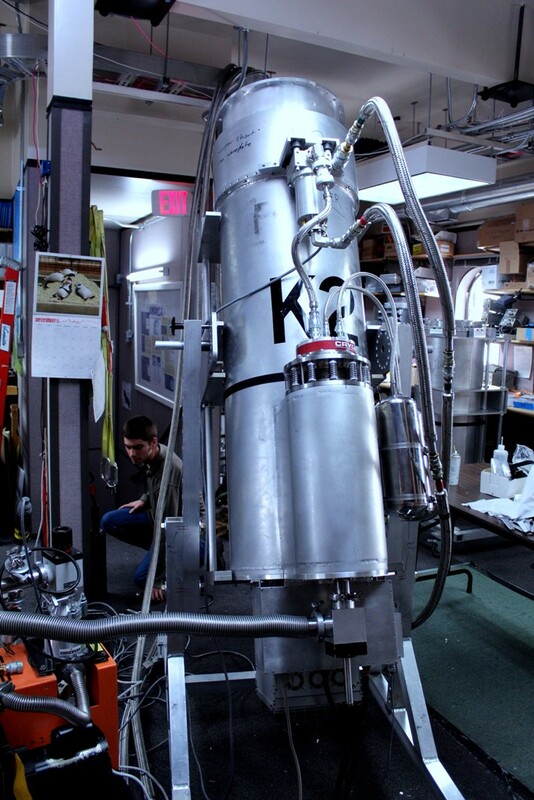 Small Polimeter Upgrade for DASI (SPUD) is the next generation instrument in the ongoing Background Imaging of Cosmic Extragalactic Polarization (BICEPT/BICEP2) program of experiments. 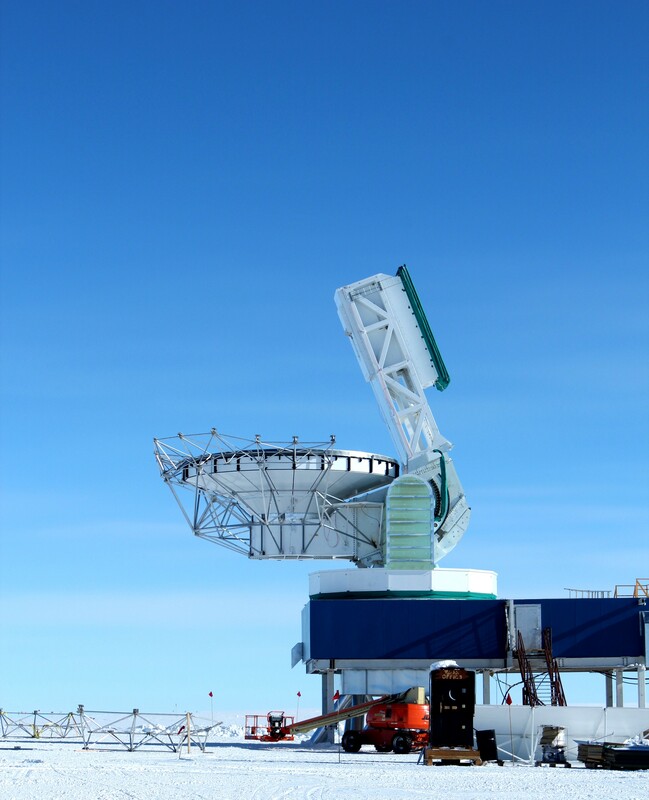 It will place multiple receivers similar to BICEP2 on the telescope mount originally built for the Degree Angular Scale Interferometer (DASI) experiment. SPUD will increase sensitivity over BICEP2 by increasing the number of detectors and in future seasons by also expanding to other frequencies to mitigate possible foreground contamination. The scientific objective is the same as BICEP2 – to attempt to measure B-mode polarization caused by gravity waves spawned in the first tiny fraction of a second after the big bang by the process of “inflation.” Inflation is the favored cosmo-genic model and finding direct “smoking-gun” evidence for it is one of the highest priorities in cosmology today. 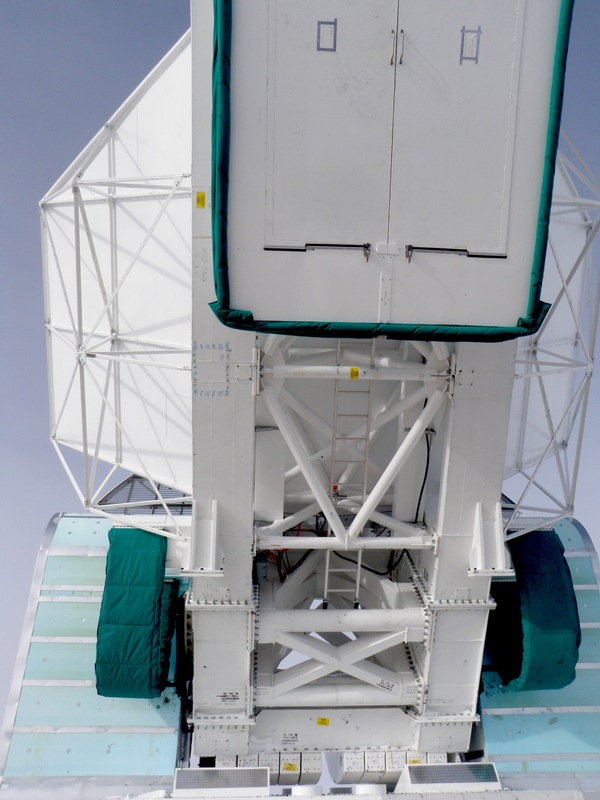 SPUD will increase sensitivity over BICEP2 by increasing the number of detectors, and, in future seasons, by also expanding to other frequencies to mitigate possible foreground contamination. As with the South Pole Telescope this is not an optical telescope. 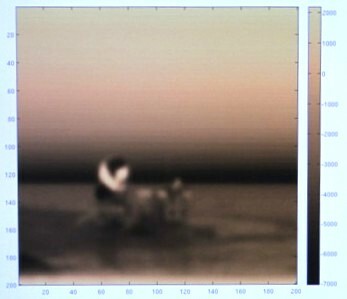 The image to the right is of the South Pole Telescope as seen through SPUD. 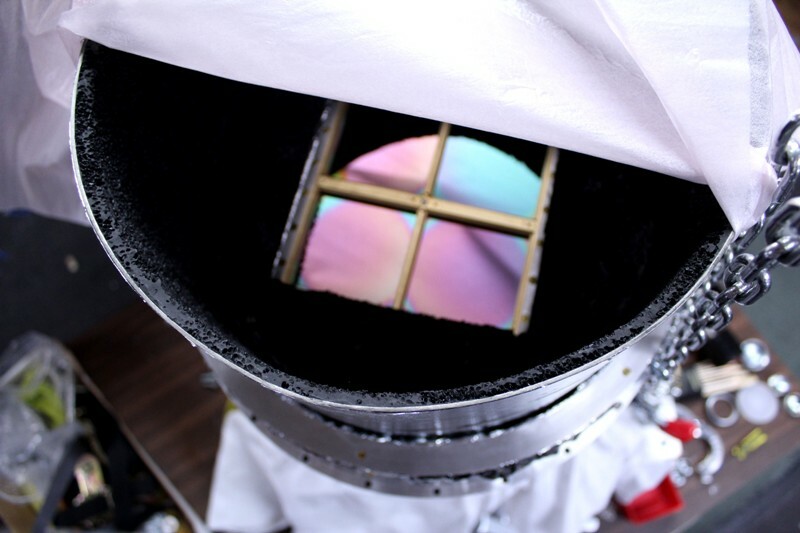 The telescope is extremely simple as far as telescopes go; inside each receiver two lenses focus the radiation on the primary sensor. Opaque Teflon and nylon disks, looking a bit like the plastic from a milk jug, help filter out unwanted wavelengths. The sensor is comprised of four silicon chips with extremely thin metal resistors imprinted upon the surface. Very slight changes in temperature from the incoming radiation induce resistance variations, producing a temperature map of the sky, of the Cosmic Microwave Background. 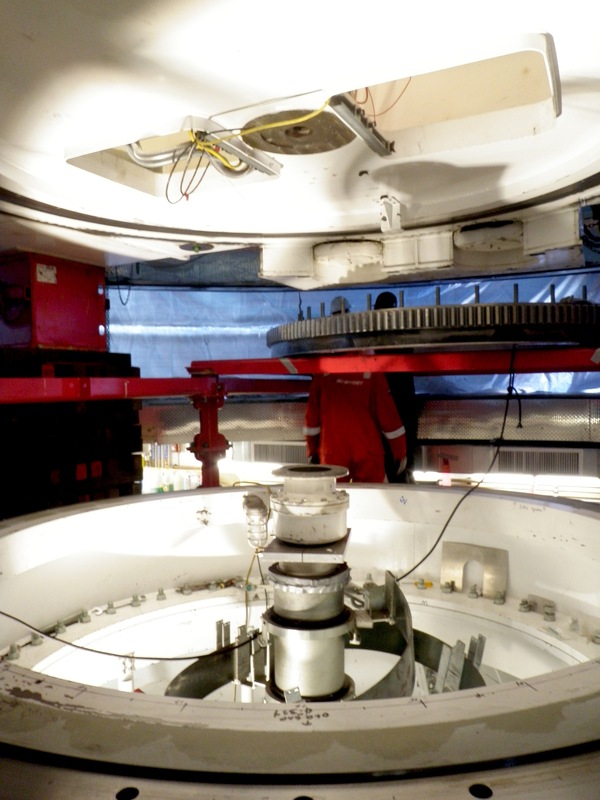 Five receivers will be mounted inside the ground shield and can rotate 360 degrees as well as scan vertically. From the station the Ground Shield looks like a giant plywood flower or bowl, but inside it’s lined with mirror-like metal. 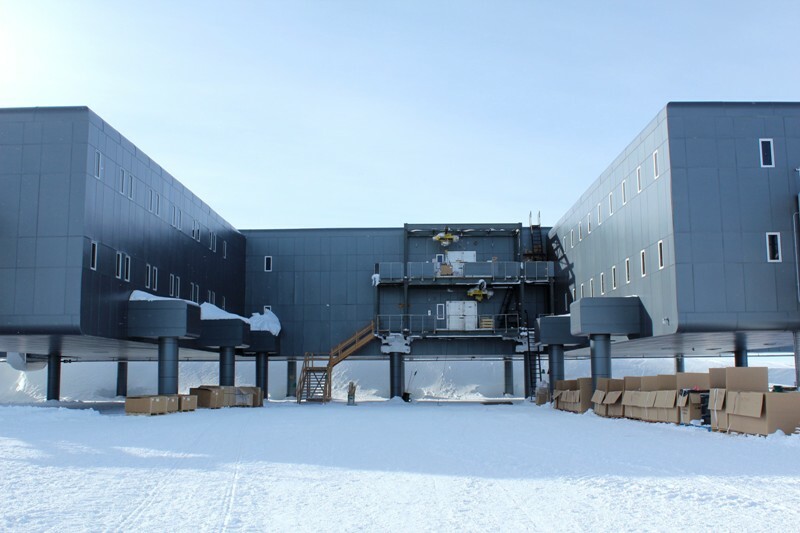 The purpose is to limit radiation bouncing off the buildings and snow surrounding MAPO. 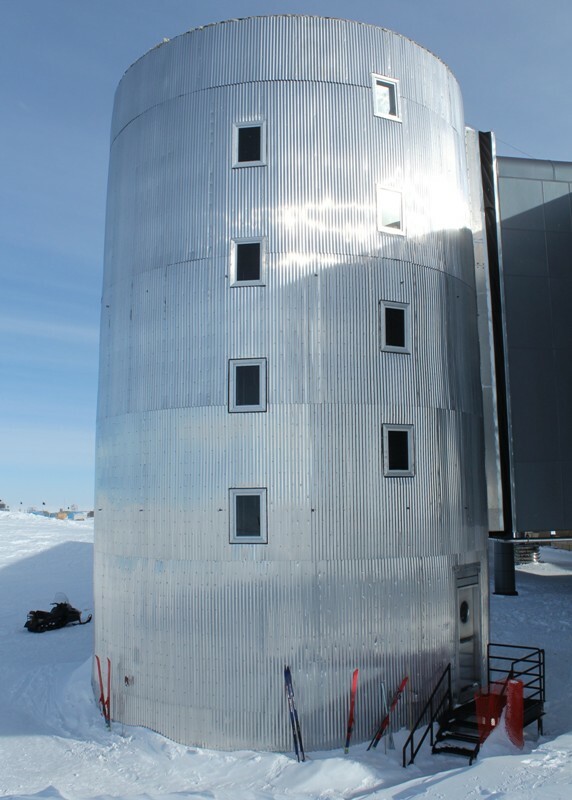 The South Pole Telescope looking at the ski directly above – the metal scaffolding is being added this year in an attempt to reduce “noise” from reflections off the snow surface. 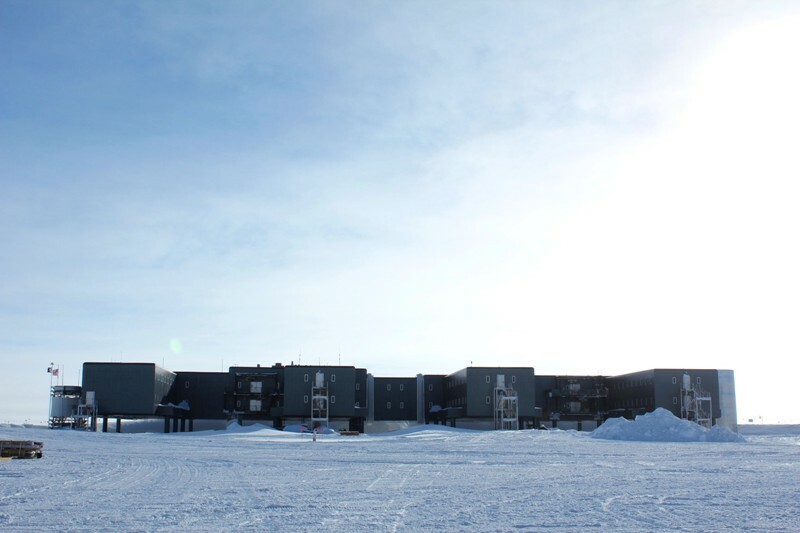 The South Pole Telescope (often referred to as simply 10-meter or “SPT”) is an iconic feature here at Pole. 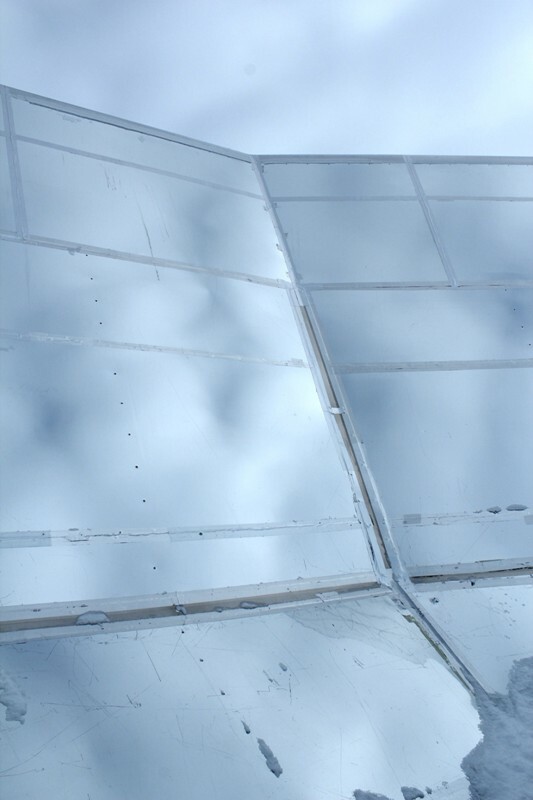 Constructed during the Austral summer of 2006-2007, the impressive two dimensional rotating 10-meter dish located just across the skiway from the station is hard to miss. Looking at the intensity and polarization anisotropy of the CMB. By surveying 4,000 square degrees of the sky with high sensitivity in three wavelength bands, the telescope can detect galaxy clusters through the spectral distortion they impart on the CMB. Researchers will use the resulting catalog of galaxy clusters to set constraints on the mysterious dark energy that dominates the mass-energy density of the universe and is causing the expansion of the universe to accelerate. The telescope is looking primarily at the CMB (or cosmic microwave background) of the universe. In particular they’re interested in finding and cataloging very distant galaxy clusters and learning more about Dark Energy, the phenomena that would explain the accelerating expansion of our universe. With a 1 arc minute beam the telescope has a relatively high resolution. The WMAP satellite is also mapping the CMB in the same spectrum (95-250 Ghz) but with far less detail. Ultimately they’re looking at changes in temperature of the CMB radiation reaching us here at Earth – these variations are extremely subtle and the focal plane is cooled down to .25 degrees above zero Kelvin with liquid helium to increase sensitivity. 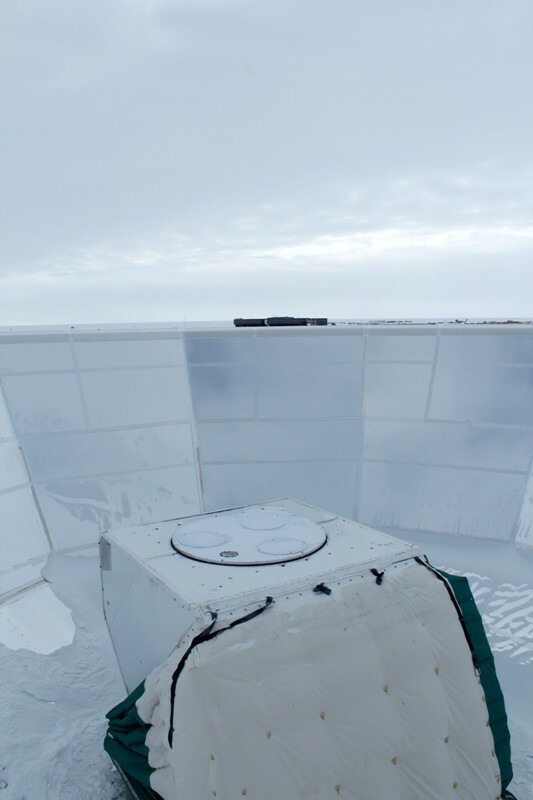 Atmospheric water vapor acts as a barrier to this type of radiation, which makes South Pole the ideal place for millimeter and sub-millimeter astronomy. This is all very good, but what is the CMB? This can be hard to explain, and harder to conceptualize, but here’s a try…The Big Bang theory states that in the very very early stages of the universe matter was so dense it was plasma, at some point there was an inflation event that caused the universe to expand at speeds faster than the speed of light. The CMB is essentially radiation from the boundary between space and this plasma – it’s the boundary between “empty space” with stars and suns and planets etc, and matter that’s so hot and dense light cannot pass through. This background glow is incredibly unifrom across the sky with a temperature of about 2.7 degrees Kelvin. The CMB is not what that part of the universe looks like now, but what it looked like 300,000 years after the big bang, when the light we’re seeing today was transmitted. We’re seeing what the universe looked like everywhere before it expanded and cooled enough to have different particles separated by space. We know that light travels at a constant rate (2.9×10^8 m/s, or roughly 671 million miles per hour) – it takes ~8.3 minutes for light from the sun to reach earth, 4.24 years for light from the nearest star to reach our sun, and 100,000 years for light to travel across the Milky Way. So… Looking into space really is looking back in time. An important fact to keep in mind is that there is no center of the universe. Though the Big Bang theory states that everything started in a condensed state and expanded rapidly from there, there’s no center and no matter where you are, everywhere in the universe will look like the center. 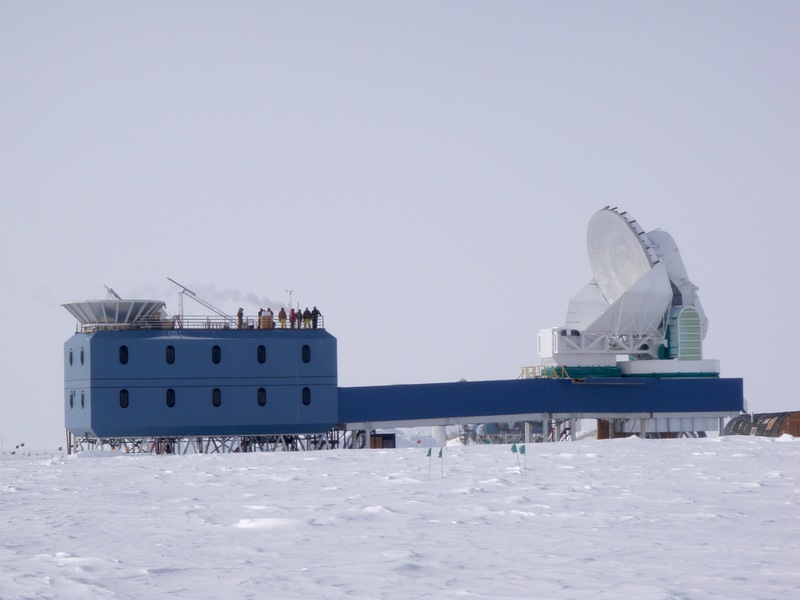 No matter where in the sky you point the telescope it will see the CMB at the same distance – kind of like if you were in the middle of a giant bubble, no matter where you looked you would see that inside surface of the bubble the same distance away. To get much useful information from the CMB you need special telescopes, the size of which affects the resolution, but everyone has seen remnants of the CMB without even knowing it. The fuzzy static on TVs (before there was 24/7 digital broadcasting)…that is the TV picking up on this white noise penetrating the universe, this distant radiation from the birth of our universe. Galaxy clusters are some of the largest physical pieces within the universe. They are so large they create something like a shadow against the backdrop of the CMB radiation. Because of its high resolution the SPT is able to locate, and thus catalogue, many previously undiscovered distant galaxy clusters. Part of their project is to create a database of such features to be analyzed with different types of telescopes in the future. The Dark Sector Lab and the SPT in it’s docked position where they can work on the receiver. 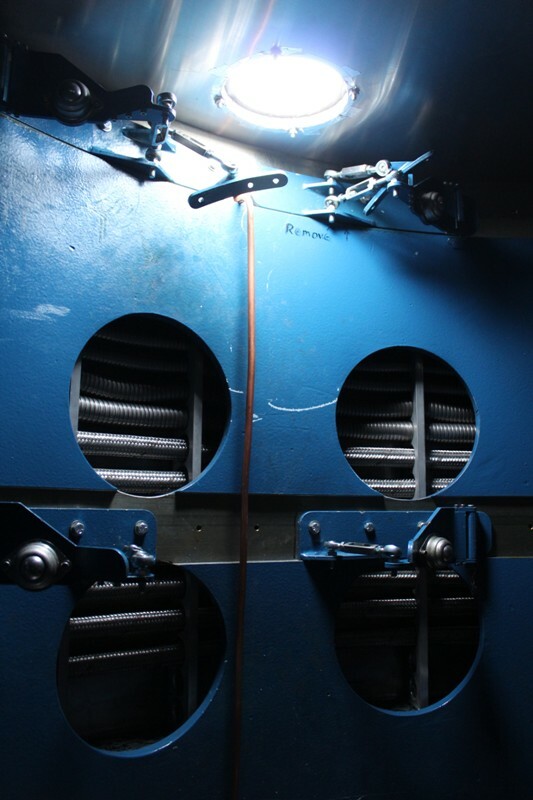 The hinge of the telescope and the doors to the receiver area – last year I got to help clean off the grease under and around this part. In the winter the grease freezes and cracks off as it gets pushed out of the hinge, in the summer it thaws and gets very messy. 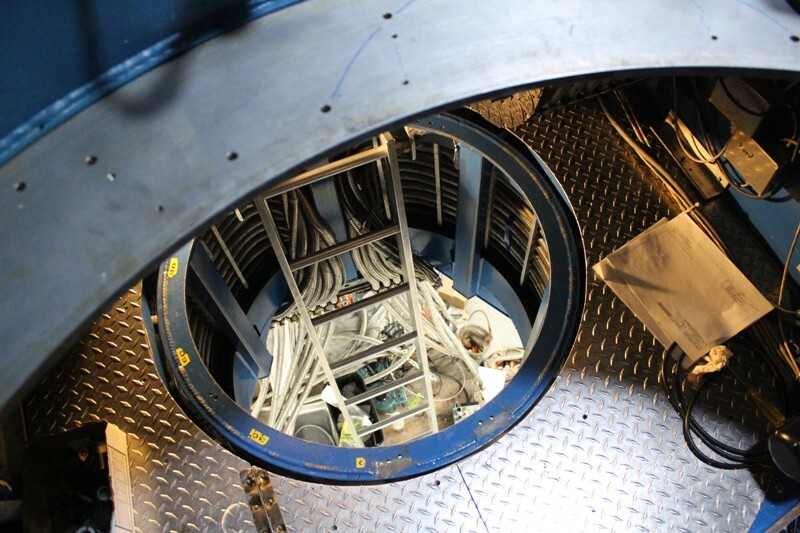 The base of the telescope – the hole is an access point to the cables and interior of the telescope, the dark piece above is the bearing on which the telescope turns. 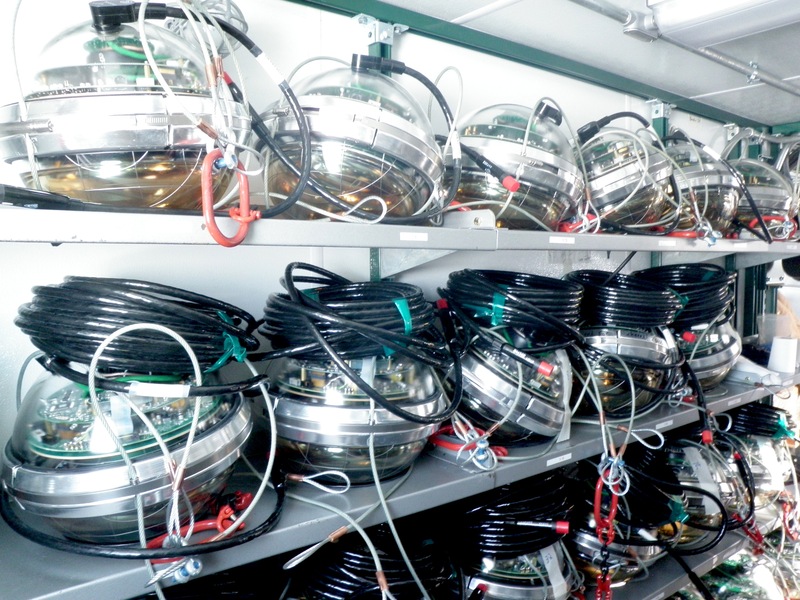 Many meters of fiber optic cables run inside the telescope allowing it to turn more than 360. As part of the bearing change last year I got to help unwind and carefully set aside all of these. 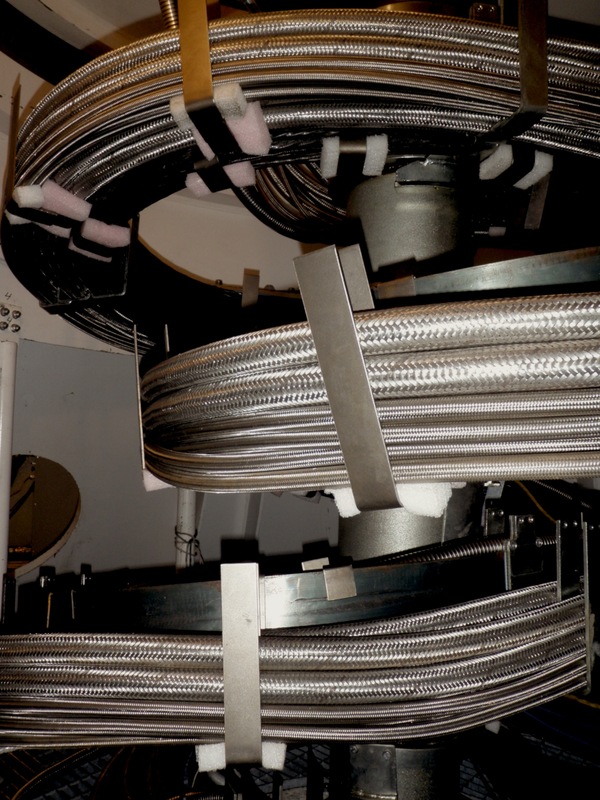 The Inside of the telescope – where the cables are usually coiled. 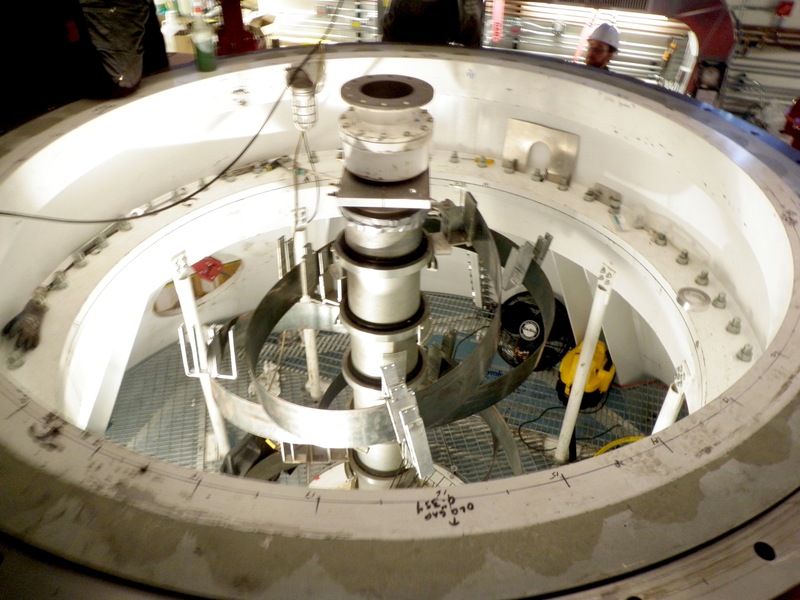 This picture was taken last year when the telescope was lifted up to change out the bearing. 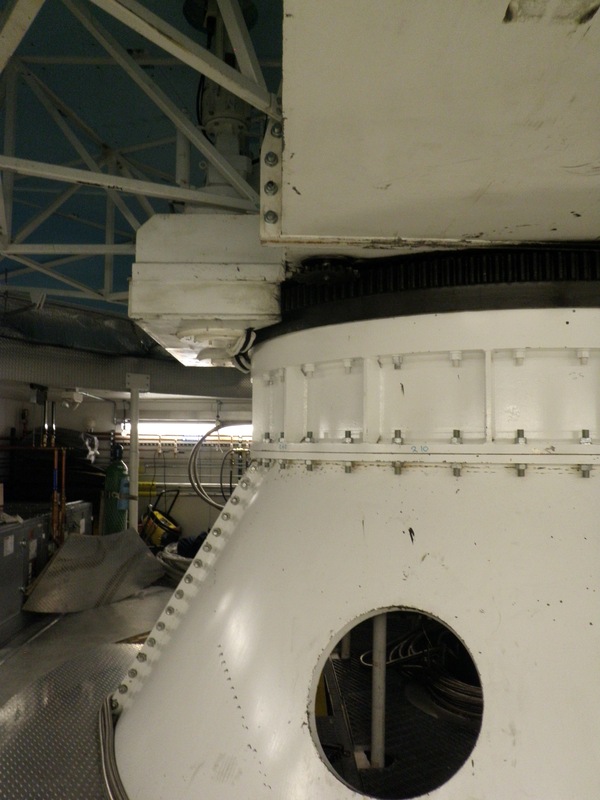 The telescope separated to remove the old bearing and slide in a new one. The raised part of the telescope weighed over 65,000lbs!! 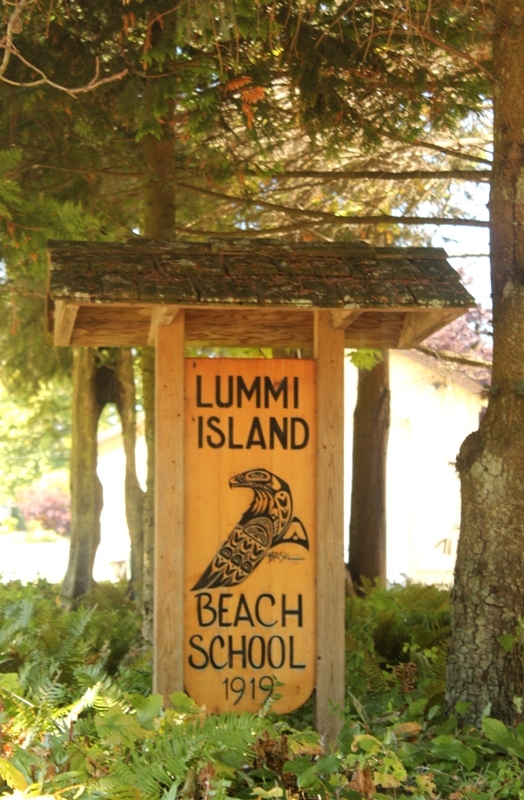 Established in 1919 Beach School is a K-6th grade, 3 classroom school on Lummi Island. In 1998 I graduated 6th grade with 3 other students. 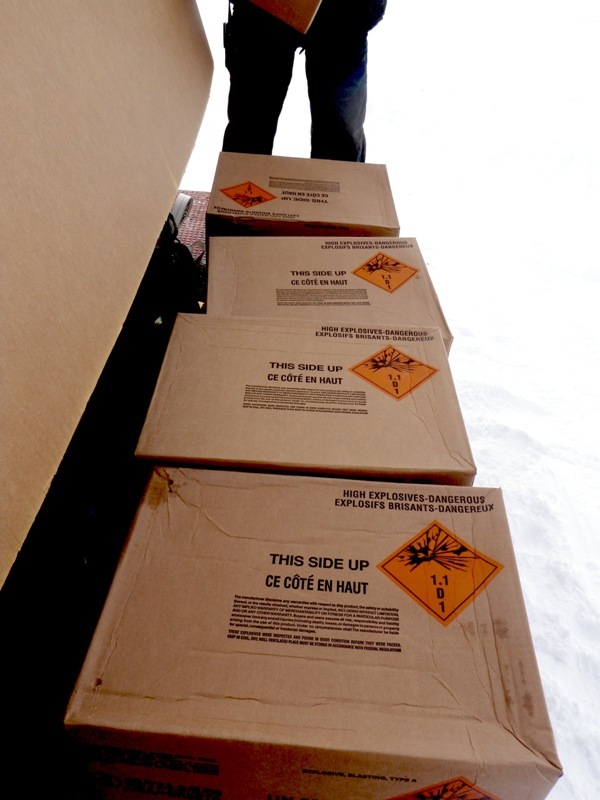 We received two 50-cube triwalls and 3 bags of letter mail yesterday! 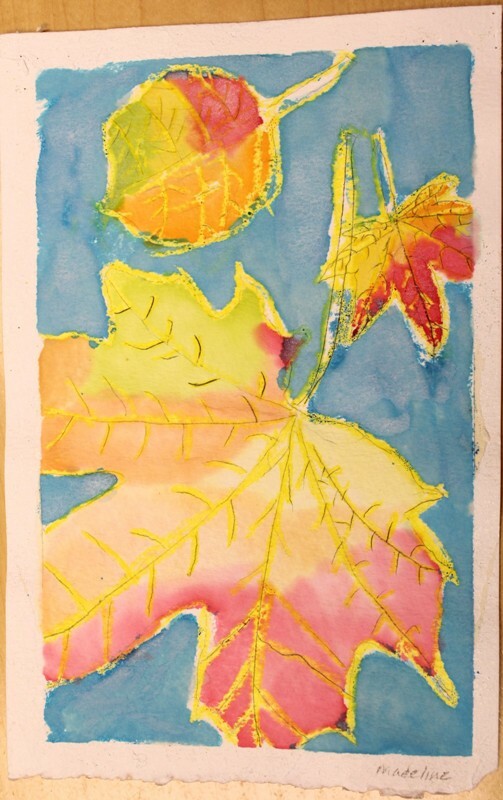 I found a package with my name on it filled with gorgeous paintings of fall leaves, a bunch of little treasures, and some good questions! 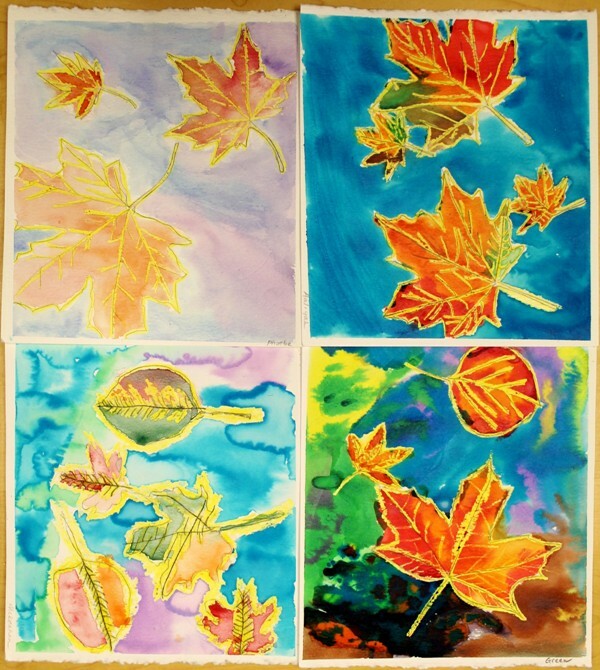 The paintings especially, are beautiful. 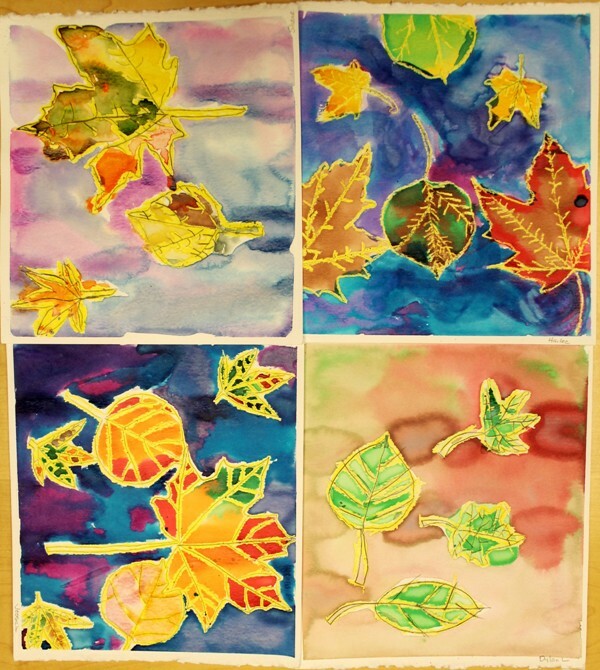 I left home in the first week of October, just as the leaves were starting to turn colors. There are no trees here and they’re one of the things I miss most. – A compass here points towards Australia. 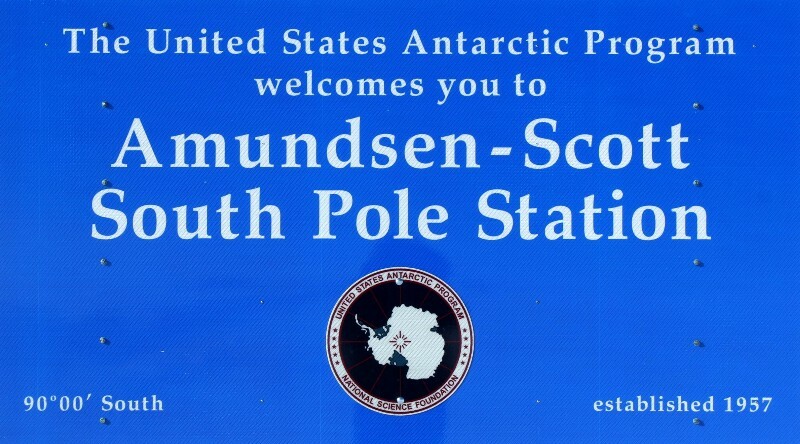 We’re at the Geographic South Pole here, not the Magnetic Pole. The Magnetic Pole (both North and South) move a bit year to year, and right now it’s somewhere in the ocean between Tasmania and Antarctica. The convergence of the lines of Longitude at the Pole confuse aircraft navigation and some GPS units so a special Polar Grid system was developed. The new station is almost in line with this grid so “Grid North” points roughly to the Ceremonial Pole and the Berms are roughly “Grid South.” But using the “normal” Latitude/Longitude system everywhere is North from here! 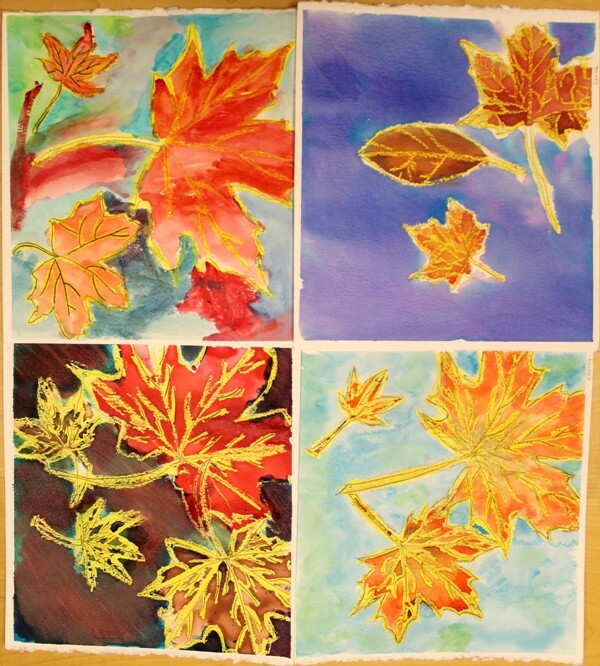 – Yes, things freeze overnight, even over dinner! If a cup of water is left outside it will freeze in an hour or two! This is also true for batteries, or shampoo, or regular gasoline and lightweight oil…many things are “DNF” and can’t be left outside for very long at all! Bananas turn black after only a few minutes exposed outside. But we don’t get much new snow – it’s not like winter back home with a thick carpet of snow over everything…here it’s lighter, almost like dust or sand, terrible for snowballs. The snow on the ground is scoured by the wind so it’s quite hard and around the station there’s enough traffic to pack it down. – In effect the air is thinner here – in more ways than one. There’s less pressure because we’re at altitude. Imagine a box of 100 air molecules evenly distributed, now imagine doubling the boxes volume without changing the number of air molecules, there’ll just be more space in between. It’s harder to breathe and just walking up a case of stairs can leave you wheezing and coughing like you’d just run a race…sometimes people have a hard time sleeping because they wake up every few hours gasping for air. After a few weeks the body makes more red blood cells to carry more oxygen for each breath taken, it compensates, or “acclimatizes.” The atmosphere seems thinner here because there’s very little water and there’s an ozone hole – so the sunlight is harsh and can burn what little skin is exposed very easily! 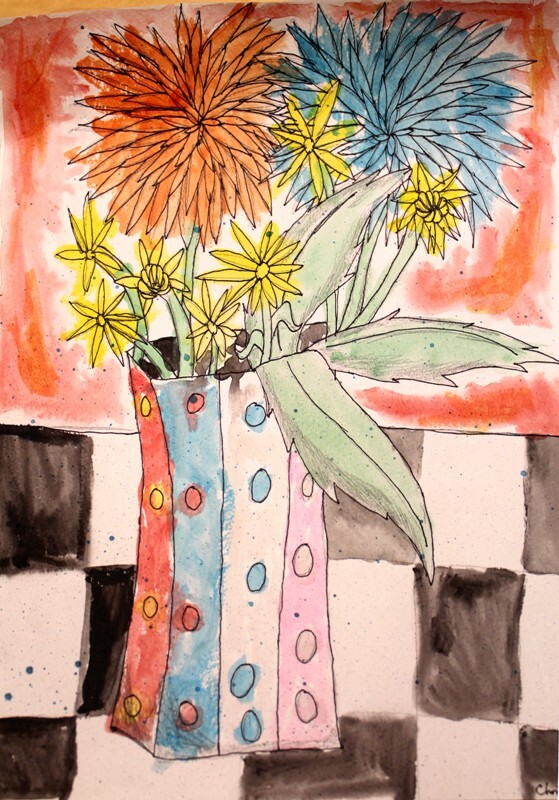 Dahlias by my cousin Chrissy who loves dragons! Thank you all so much! 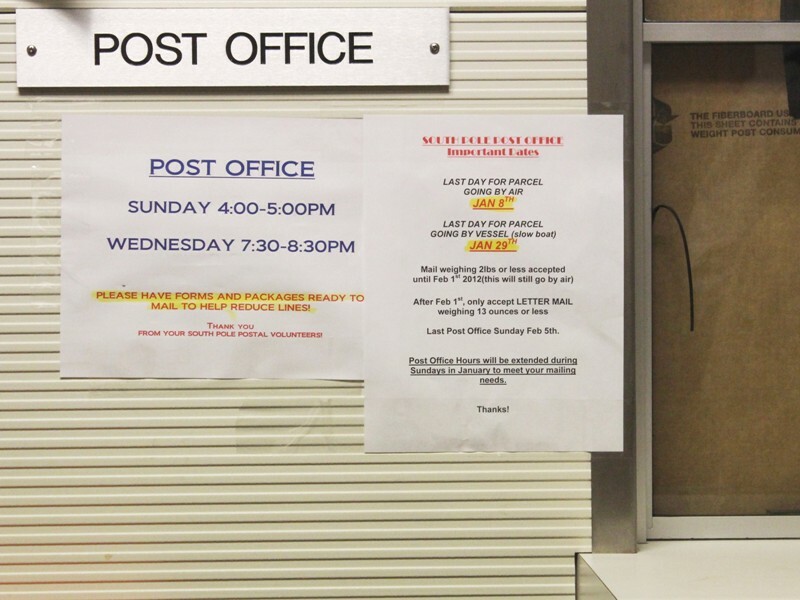 Mail arrives here in large orange nylon bags and giant cardboard boxes (triwalls) – Comms announces an all-call asking for help and we all fire line the packages up the stairs and into the station. 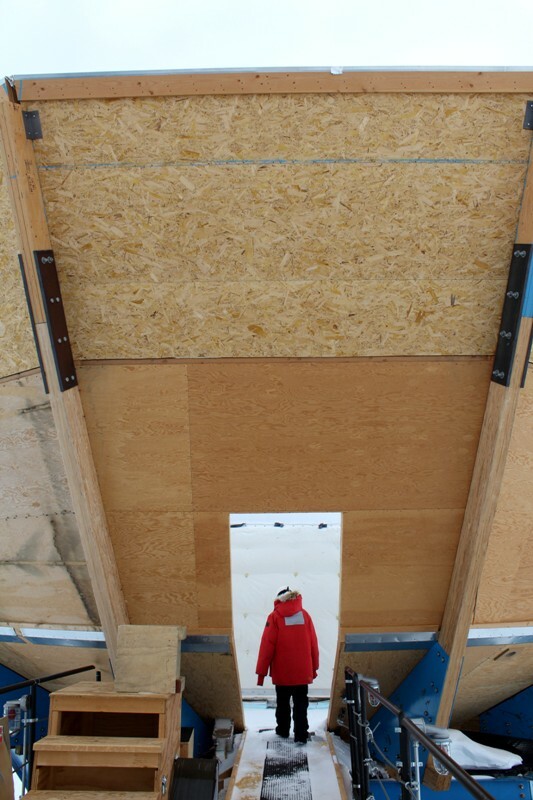 Inside they are set on the floor, lining the hallway. 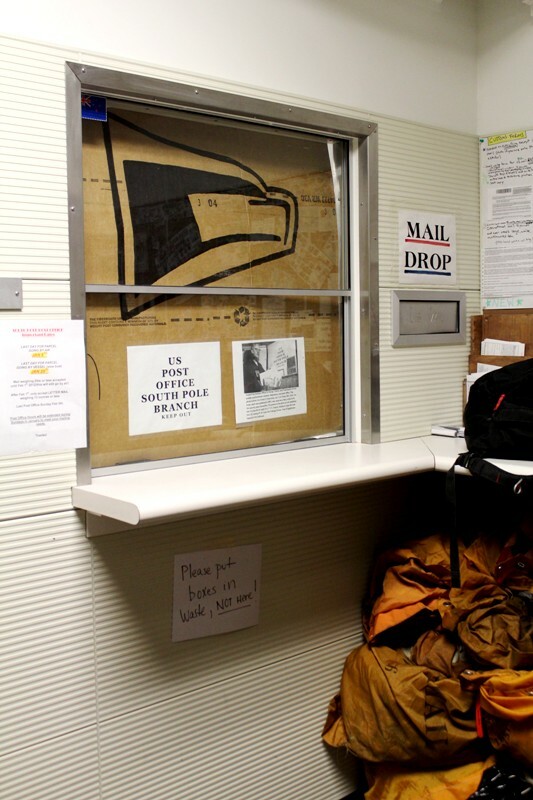 There is an official US South Pole post office here, run by volunteers here at the station. There’s something special about getting a letter in the mail, and even more so for packages, but getting mail down here is almost as exciting as Christmas. It’s a physical connection to the world back home, a place so different and distant from here. We are thousands of miles from the United States, and yet most people here are American. Everyone here speaks English, listens to the same music, has watched the same movies, read the same books; sometimes it’s hard to believe we’re so far away from home. We have access to the internet for several hours each day (though they’re usually during my work hours) – via satellites orbiting near the equator. One of the satellites we use is an older unit with a bit of a wobbly orbit, allowing it to just barely come into view over the horizon for a few hours each day. The USAP also buys some time from a NASA satellite. Bandwidth is limited, and science data transfers take precedence over email, facebook, or calls home. Iridium phones work on another satellite network so they can be used 24/7 if needed for an emergency, but for the most part we are fairly isolated. There’s no radio, no TV, no YouTube (uses too much bandwidth), no looking things up online all the time – think of all the little questions or arguments that are resolved with “Google it!” Here we make bets and someone writes it down to look it up when the satellite comes up next. So what do we do in our spare time? Well, there’s not very much of it, working 54 hour weeks – 6 days a week – most time off is spent eating or sleeping. Conversation topics are varied and interesting, but often revolve around how well, or not so well, one slept the night before and what will be for the next meal. Scrabble, cribbage, chess tournaments are ongoing throughout the season, movies are played in the two station lounges almost every night, dance and exercise classes are offered in the gym between basketball and volleyball games, “paper telephone” is popular and one of my favorite games. After spending all day working with the rest of the cargo team and eating in the crowded galley every meal I often return to my Jamesway after dinner to read for a while in the peace and quiet of solitude. Why is there this giant station? Why do we have US Air Force planes? Why is there so much going on down here? All of these questions, and more, can be answered with the one word: SCIENCE!Everything here is in support of research and for the most part funded through the US National Science Foundation (NSF). 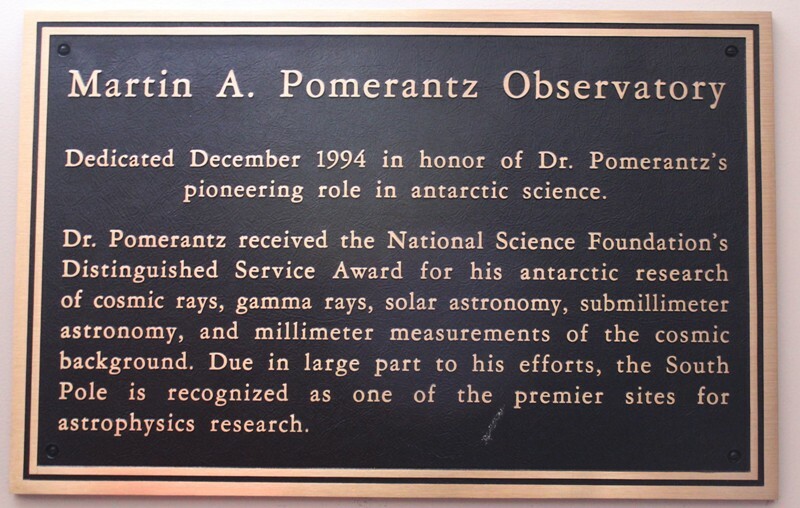 The South Pole, with an elevation of nearly 10,000 feet, an average yearly temperature of -56.9F, and 6 months of darkness is an ideal site for astronomical observations. 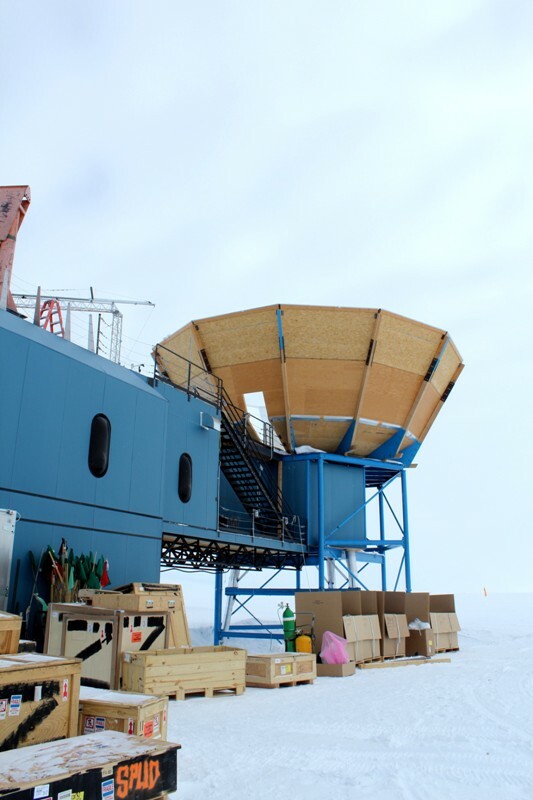 While there are numerous projects of both short and long term duration the two major ones are IceCube and the 10 meter South Pole Telescope. NOAA (the National Oceanic and Atmospheric Administration) has a long term Earth Systems Research Laboratory monitoring site here. 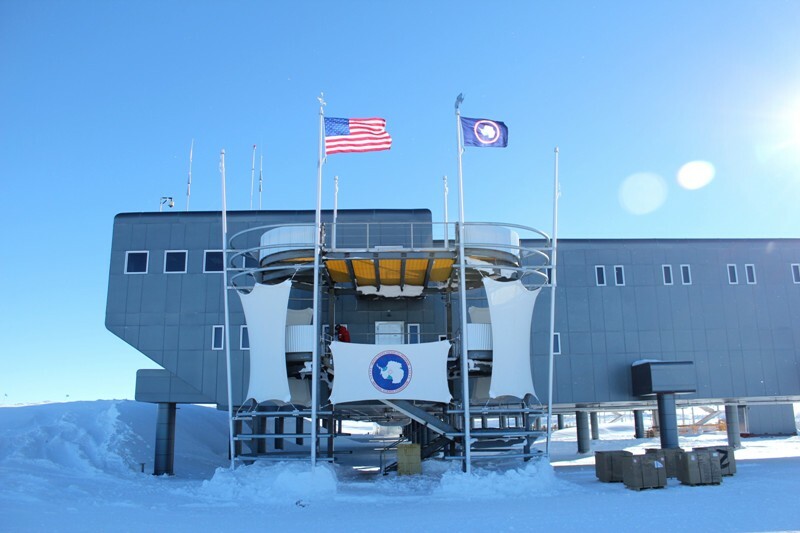 It’s part of several Global Monitoring Division sites – of which Summit Station, Greenland is also affiliated. 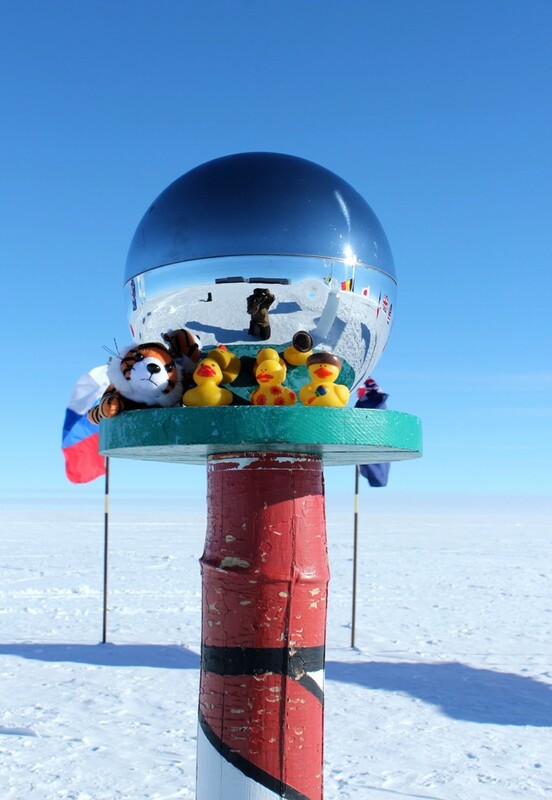 Over the next few posts I’ll highlight some of the primary research projects currently underway here at the South Pole. 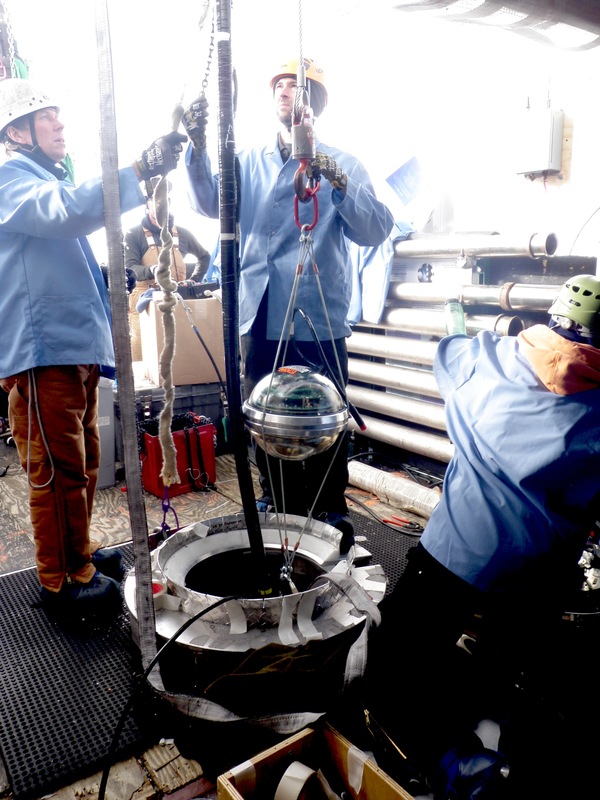 The IceCube project is a Neutrino detector. Sounds simple enough, but this detector is unlike any other in the world. Neutrinos are sub-atomic particles of immense energy, but lacking an electric charge – so tiny and with so much energy that they pass through most matter without interaction. 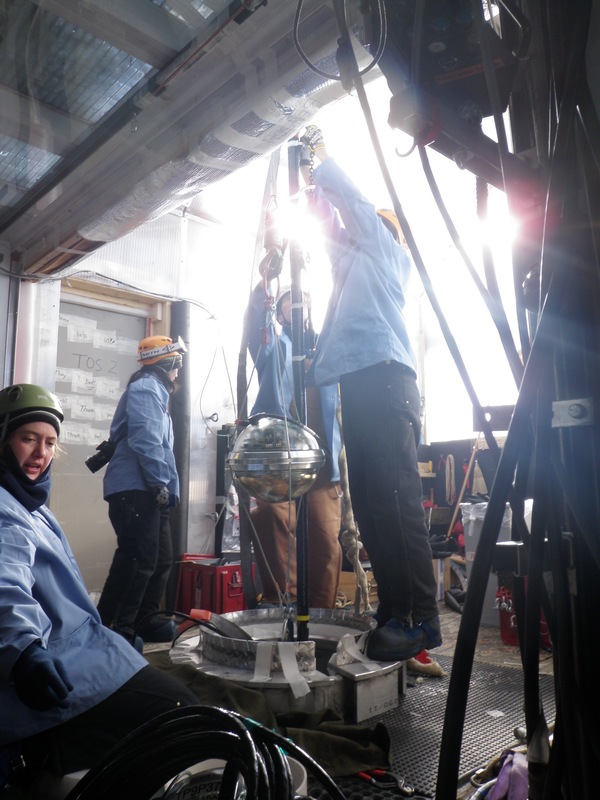 Neutrinos are a byproduct of radioactive decay and can be found many places here on earth, but IceCube is interested in a different scale. This project is focusing on neutrinos formed from extremely high energy events such as exploding stars, black holes, and gamma ray bursts. The project goals are to explain these events more thoroughly, shed light on dark matter in our universe, and study the more remote parts of the universe that previously have been too obscured to see. Neutrinos are not affected by magnetic fields, take an extremely long time to decay, and are rarely absorbed, putting them above neutrons or protons as useful particles to study the corners of the universe. There are several detectors around the world, but the one here at Pole is particularly interesting as it is using the entire earth as a filter. 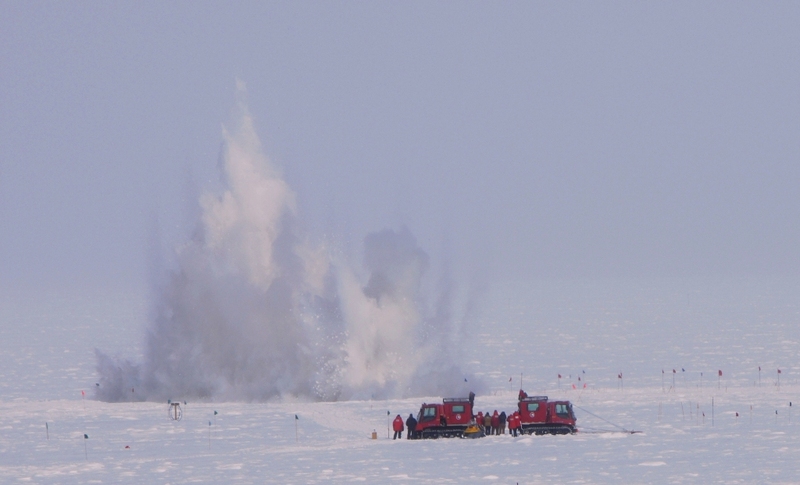 Buried 1.5 kilometers beneath the ice surface the array spans a cubic kilometer! 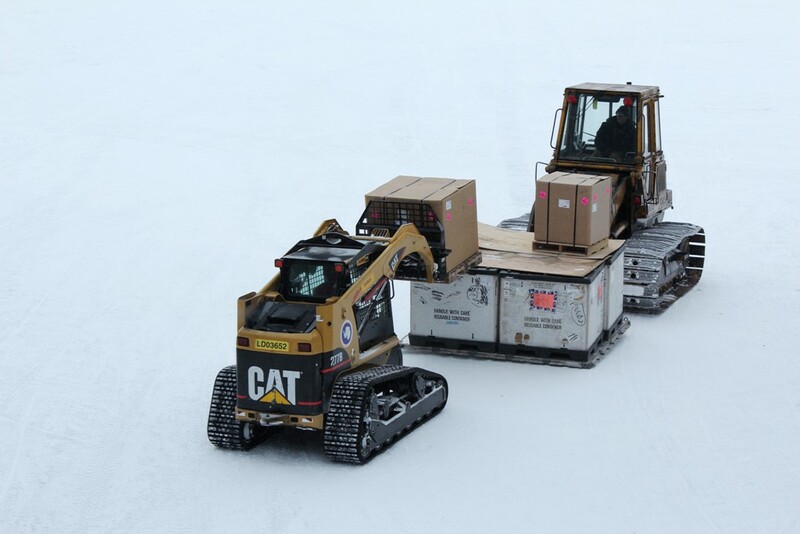 5160 DOMs (digital optical module) were deployed on 86 vertical strings frozen within the ice sheet. A hot water drill bored down to 2450m with 1000psi of near boiling water, leaving a tube of liquid water with a 24hr window before it began to freeze. 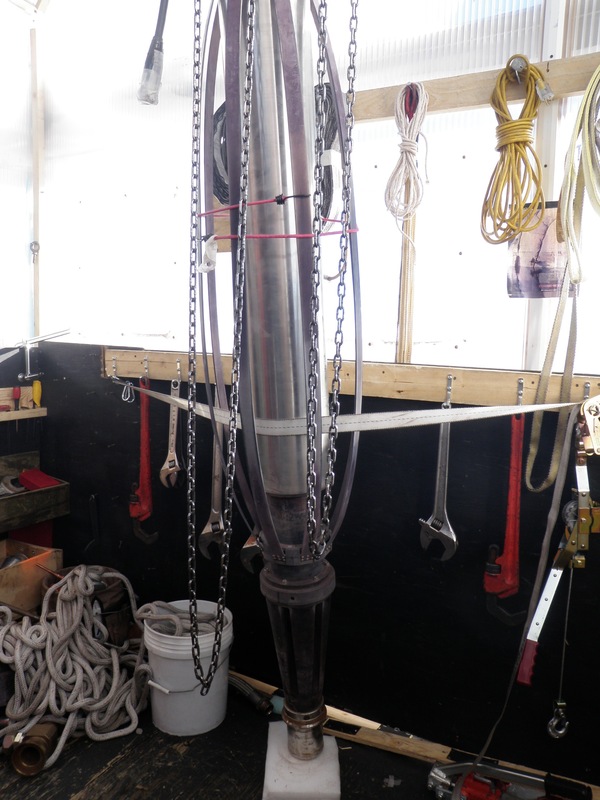 A cable was lowered with the DOMs (61-64 per cable) attached at set intervals. 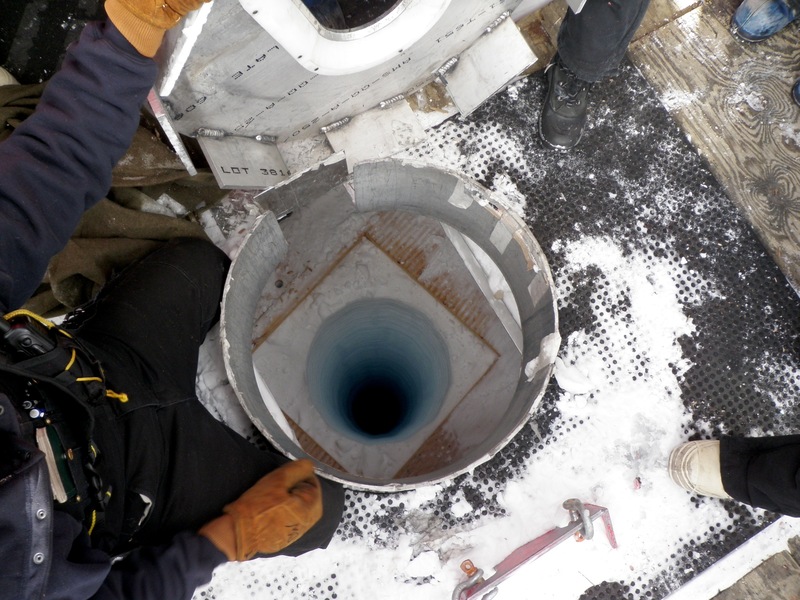 Another part of the project is IceTop which deployed 324 DOMs in tanks on the surface. 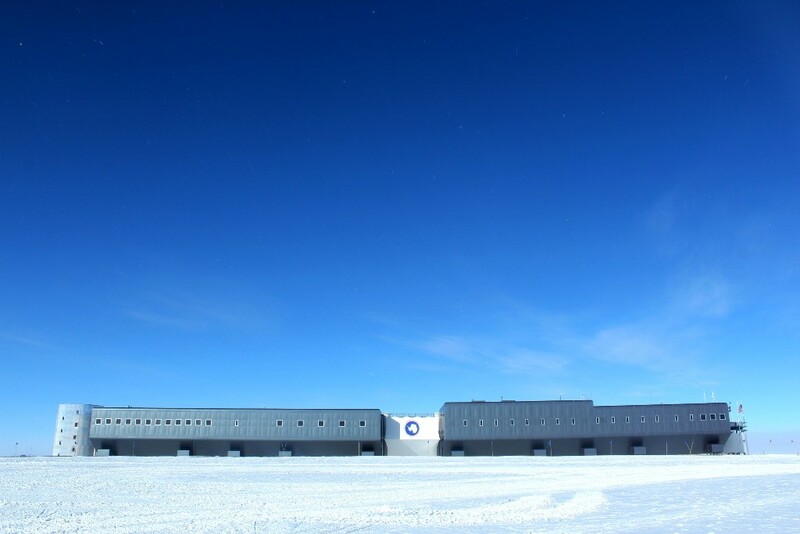 (http://icecube.wisc.edu/science/icetop) This is an immense project and took over 6 years to complete, the final string being deployed in December 2010. 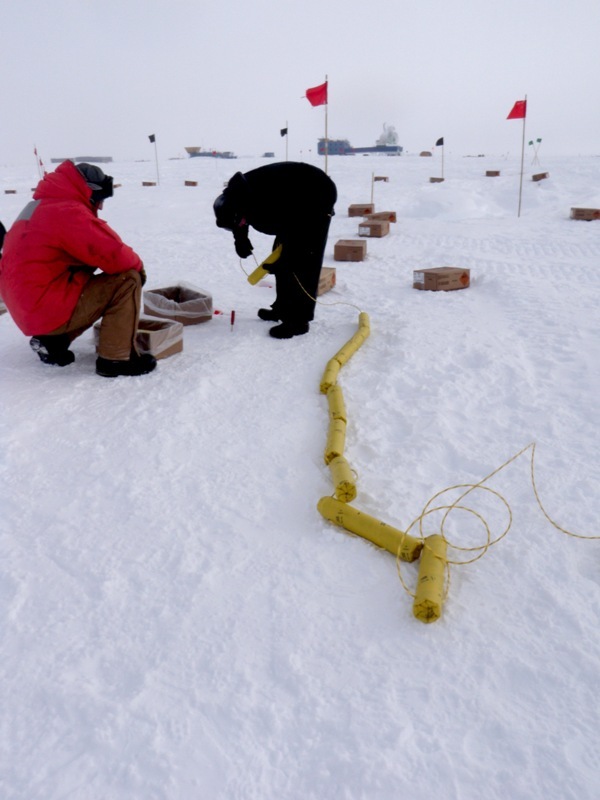 The detector has been collecting data since the first few strings were completed in 2006 and is expected to last another 20 years before the ice stretches and breaks the cables. An international collaboration, there are over 250 scientists around the world are analyzing the overwhelming amount of data being produced. With so many sensors in the ice and with such a large expense it’s good to know that there has been less than a 2% failure rate of the DOMs. The idea behind having a three dimensional detector is that it is able to track the direction and speed of incoming particles. While many particles come from “above” here, they are noticed first by the IceTop array and can be weeded out, as muons or other various particles not necessarily neutrinos. 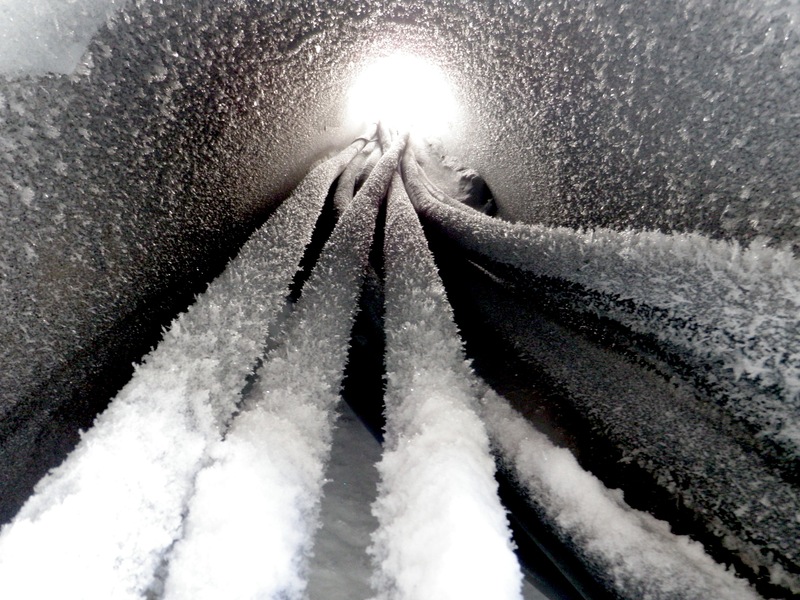 Particles that come from “below” – or from the North Pole, travelling through the earth, are more likely to be actual neutrinos as most other things are essentially filtered out by the earth’s mass. How many DOMs total are deployed within the ice here? 5484! How many miles of copper wire are buried here to transfer data from the strings to the data center in the ICL (IceCube Lab)? 11,650 miles! The IceCube Lab or ICL – all the cables from the DOM strings come back to the ICL where the data is compiled and stored. A hole over 2.5km deep! The DOMs are hung vertically and tensioned carefully so the cable bends around each sensor. Happy New Year to everyone around the world! Welcome 2012! 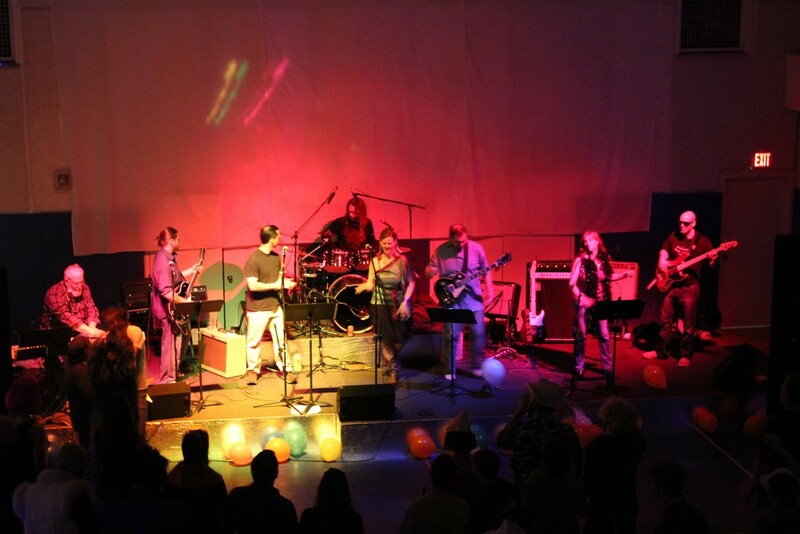 The New Year was celebrated here with 4 live “local bands” and a large dance party in the gym…Despite having only a few weeks to get together and creat a set list the music was wonderful. Today is a beautiful bluebird day, back down to a more average temperature of -12.6F and 12knots of wind. 6 More weeks left until station closing. We’ll hopefully be getting many more flights per day from here on out, which will help make the weeks pass. This last stretch can be a bit of a haul, especially with everyone excited about post-ice travel plans. 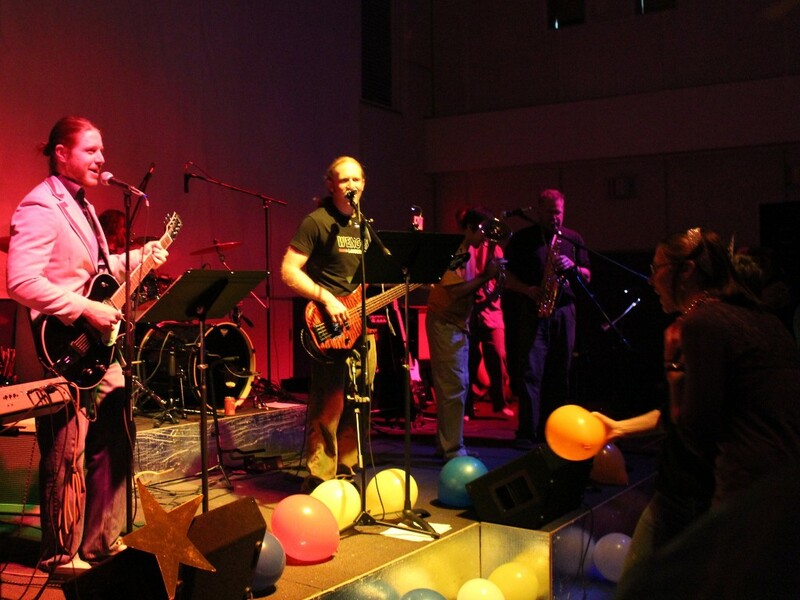 The funk band kickin it!